4 Bedroom Semi Detached House For Sale in Tunbridge Wells for Guide Price £625,000. Guide price 625,000 - 650,000. 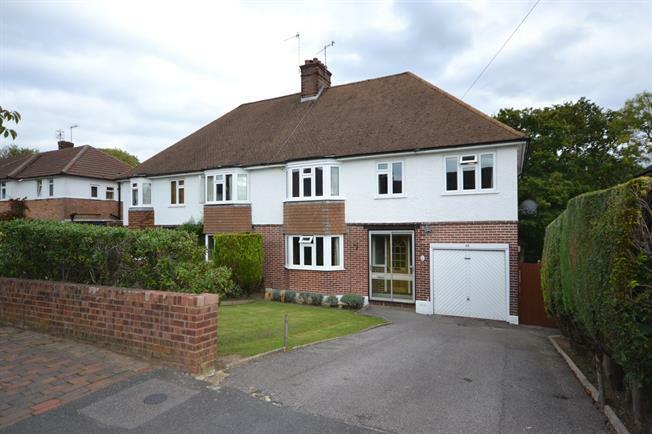 Freeman Forman are delighted to present this extended four bedroom semi detached house, occupying an enviable position in the St. Johns area of Tunbridge Wells, close to the High Brooms Mainline Railway Station, The Grammar Schools, St. Johns Primary School and The Town Centre. The property offers well proportioned accommodation which includes a front porch, entrance hall with storage cupboard, sitting room room with bay window and fireplace, dining room with fireplace, kitchen/breakfast room and cloakroom. Stairs rise from the entrance hall to the first floor landing with loft access, impressive master bedroom with extensive wardrobe space, three further bedrooms, bathroom with separate shower, a further shower room and separate WC. The accommodation benefits from a gas central heating system and double glazing throughout. Outside to the front of the property is a driveway which gives access to the single garage and a front garden laid mainly to lawn. There is gated side access to the rear garden which is of a generous size and boasts a large patio area with a lower level of garden all of which backs directly onto trees. There are two timber garden sheds in the garden. An internal viewing of this superb family home comes highly recommended.